I had a couple of quick trips to the river last week. The first time I went in the afternoon and decided to try and catch a few fish on live minnows. I set up a paternoster with a size 6 circle hook on a wire anti-pike trace and I also took a float rod to fish maggot and catch some baits. The bait fishing was easily accomplished and I managed not just minnows but two or three bleak as well. However, that was the end of it. One trout dropped and a small perch landed was my total catch. Not good. I released most of the baits back into the river when I'd finished fishing. 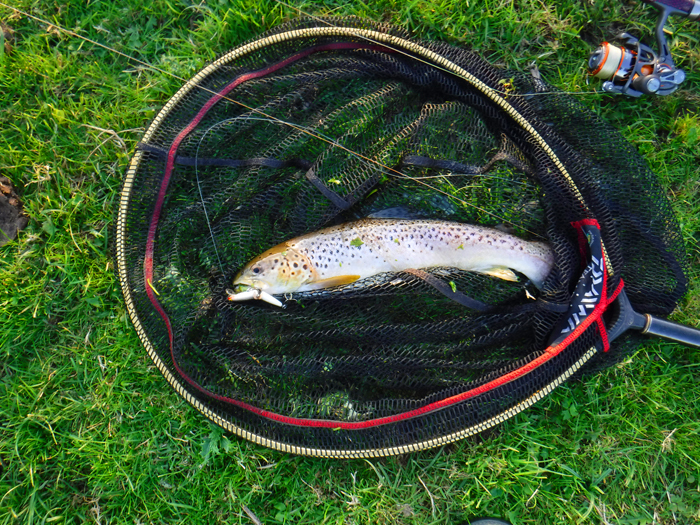 The second trip was an early evening session after seatrout. Having had a bit of rain I thought that the fish might be more inclined to bite than recently. Well in that I was correct. I worked my way slowly down a 300m stretch of river fishing a 7cm Rapala by casting across and swinging it back to my bank. Although the first third of the stretch was fishless I was fairly confident. 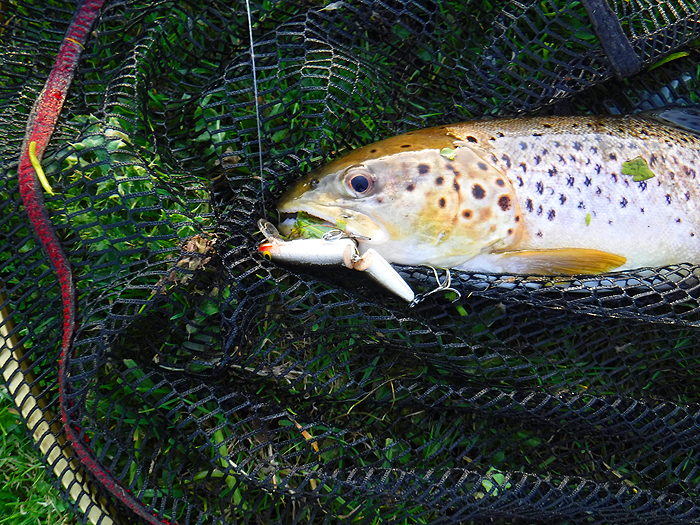 When I reached the first shallow riffle I flicked the lure across the fast water and about half way back it was attacked by a good seatrout (5-6lb) which hooked itself, took a couple of metres of line against a tight clutch, thrashed wildly, jumped and came unstuck. I was gutted. I fished on and at the next set of shallows I hooked two trout and landed one tiddler - not much bigger than the little plug. After another quiet spell I reached the third and last set of shallows. Again, first cast I was into a trout which typically jumped and ran until I could wangle it into the net. 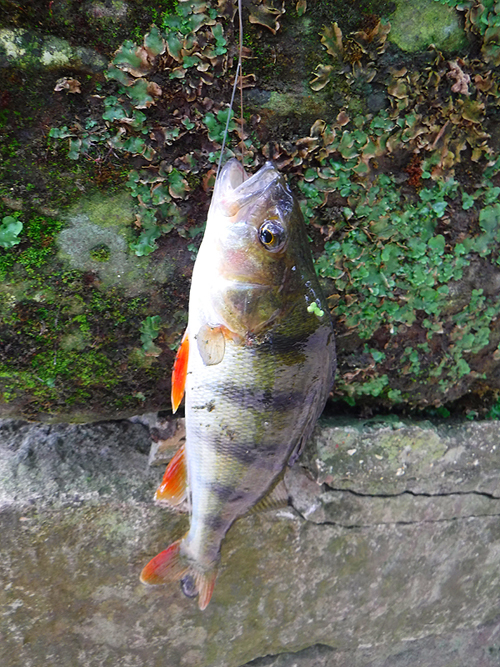 It was a bit on the skinny side but probably weighed about two-and-a-half pounds (well over a kilo anyway). 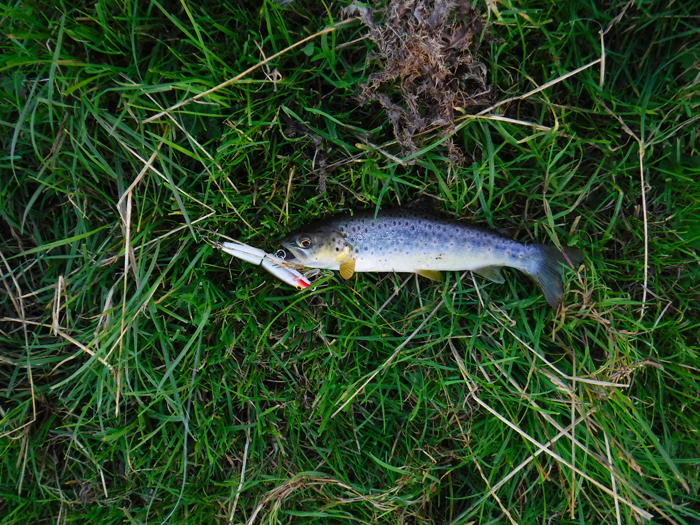 It wasn't the most handsome seatrout I've ever seen but I was fairly pleased to get one after losing the first fish. Apart from a couple more furtive plucks that was that and I went home. Perhaps next time I'll land a bigger fish. The minnow caught perch. Unusually with the hook well inside its mouth but barbless so easily removed. My sizeable sea trout. Fatter than it looks under the fold of net. Close up showing the lure.